This delicious Red Beet Grapefruit Juice is rich in nutrients and a great cleanser. When summer turns into fall, I always feel like cleaning up my diet and my life. Summer is my season for indulging. I love summer. I spend more time outside, I hang out with friends more, I cook less, eat out more and I indulge more in the sweet things of life. A glass of wine, some ice cream, dinner at a nice restaurant. Fall is my typical ‘detox’ time. It’s when I draw in, re-think life and reflect upon what’s important to me and what direction I want to take in my life. Fall is about restoring balance, becoming still and drawing back in. I de-clutter my mind, my body and my home. When it comes to detoxing my mind, I spend more time indoors, in silence, meditating, contemplating, and writing. When it comes to my yoga practice, I go back to the basics, the foundation. It’s a whole different energy. In summer I ‘fly’ high, I burst with energy and don’t need much sleep. In fall and winter, I look for stillness. I become quieter, more mindful. I rest more. When it comes to the foods I eat, I eat slower foods, foods that ground me down. I also juice more. I love to use beets in my juices. Beets are grounding and deeply cleansing. They help detoxify the liver and stimulate digestion. I love to add ginger, cinnamon and orange blossom honey. 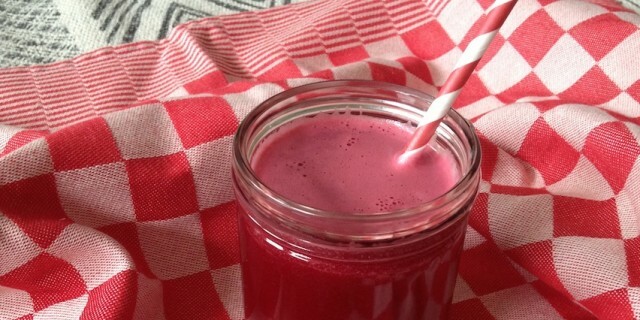 They add some warmth and sweetness to this slightly bitter Red Beet Grapefruit Juice. Juice all produce. Add orange blossom honey and cinnamon. Mix well and enjoy straight away!